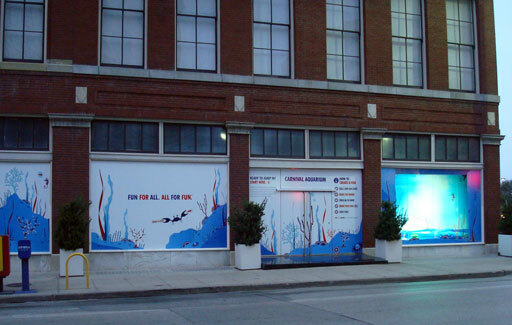 A Supergraphic advertisement rising on the wall of 1920 Elm Street in 2010 was the main culprit for major changes in the area. The pocket park located at Harwood/Elm was adversely affected (see this post for more information) and the district’s image as a whole was compromised by a non-compatible form of large-scale advertising. While perhaps appropriate in some areas of downtown, a large-scale advertising does nothing to enhance the character of the Harwood Historic District. Its promises of “fast mobile service” or “exciting action movies” adds no community benefits to a growing neighborhood. The “artistic merits” of the sign are often debatable, and content can quickly become stale after remaining unchanged for months. Most importantly, the size of the Supergraphic that appeared at Harwood/Elm clearly targets auto users arriving into downtown, ignoring the pedestrian experience at street level. 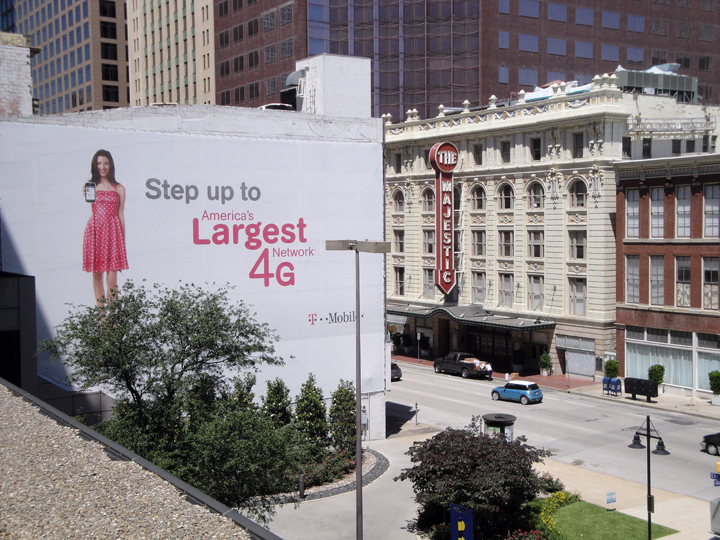 It transforms an important stretch of Elm Street into a highway bilboard and the large advertisement competes with the surrounding environment for attention. In fact — when paired against the backdrop of the Majestic Theatre’s impressive architecture — it’s quite insulting to place messages of consumerism higher and larger than that of our cultural identity. As Downtown Dallas Inc proposes additional advertising as part of the Downtown Dallas 360 Plan, how will this affect historic buildings, important districts and open spaces in other areas of downtown Dallas? As some cities around the world are removing outdoor advertising due to “visual pollution” leaders in Dallas are campaigning for more. How long until we reach the point of saturation where we have sold our city’s cultural heritage and character to the highest bidder? Even though Supergraphic advertising is not allowed to cover historic structures, close proximity can mask the identity of a historic district. This is not to say that all forms of advertising are bad for the district. Focusing on groud level experiences to interact with pedestrians can create memorable campaigns. Temporary night projections can enhance favorite architectural elements while adding excitement to a district. These new types of advertising are much less intrusive and can reach a broader audience and should be incorporated into the Harwood Historic District where appropriate. But when advertising is out of scale for the neighborhood and actually detracts from that which make us unique, residents and individuals should hold businesses accountable when advertising adversely changes our urban fabric. Supergraphics not only affect property owners’ accounting books (in a positive way), but it will affect the quality of life and personal experience as people interact with the Dallas of the 21st Century.